 known for their fun flavors and ice cream puffs! It is known that Debra loves ice cream, thus we must try any interesting ice cream shops in the vicinity. The Parlor is just such a place! They have delicious and unique ice cream flavours, which they serve with pastries--perfect! The shop itself is small, and has the rustic chic look that all these ice cream joints seem to utilize… Anyway, I haven’t been able to try their signature Puff dessert since they’re always out. Very annoying. The Parlor’s ice cream speaks for itself though, it is definitely one of the better ice creameries in the area. 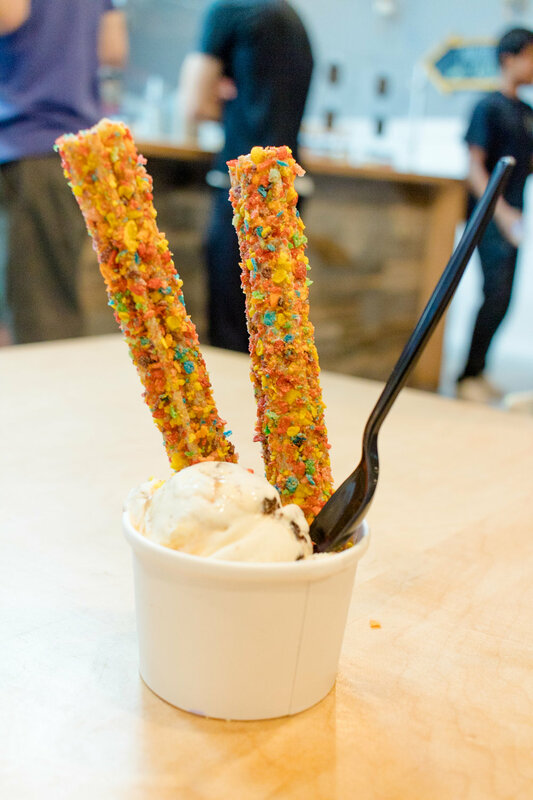 Mint Chip Ice Cream with Fruity Pebbles Churros (Natalia): I love churros. As every person who has lived in Cali should. I got the regular churros my first time here--you can’t beat cinnamon in my book! But, I decided to branch out and try the fruity pebble coated ones this time. I enjoyed The Parlor’s ice cream, it had good ice cream to chocolate ratio and a smooth texture. 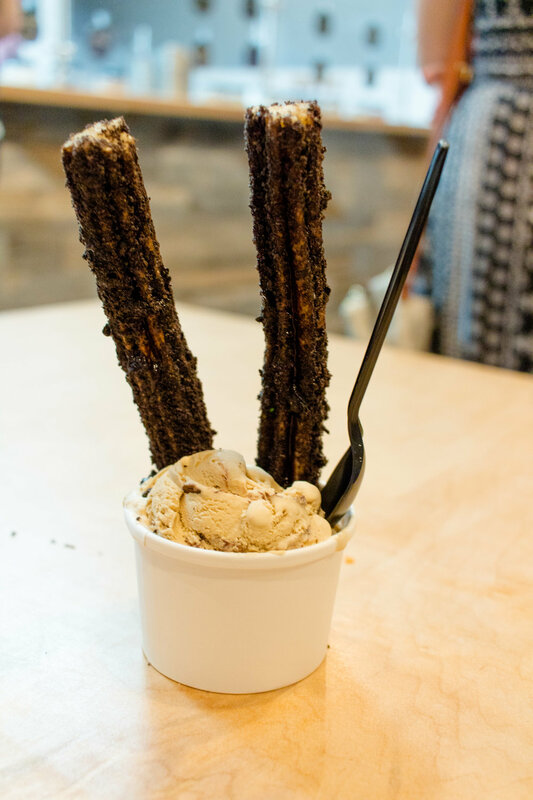 I ate my churros first (they make some delicious churros, even if they’re obviously cold), because mint + cinnamon/fruity crumbs = nasty. However, the space is too small for their demand. It’s over crowded with not enough sitting for the customers. I recommend trying some of their fun flavours, since they do a good job crafting them. The ice cream was yummy though! I will agree with Natalia that the space is little small, especially because it is one of those insta-trendy places to go. It is a great place to hang out with friends, family, and especially the little ones.